In the latest issue of Make It Today Crochet Club, we've got all kinds of lovely projects to make in candy-inspired shades! Fall in love with our Goldilocks doll and ballerina hippo, whip up a set of tasty-looking biscuits and lacy doilies, or jazz up your home with vibrant plant pot cosies. For those who enjoy crocheting and sewing, our crochet-trimmed patchwork baby blanket will be right up your street! 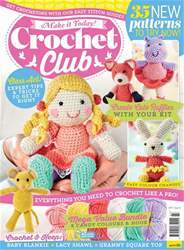 We also have suggestions for fun crochet-themed holidays, plus a great selection of giveaway prizes including a Gemini Lock Pro worth more than £249. Get your copy now!